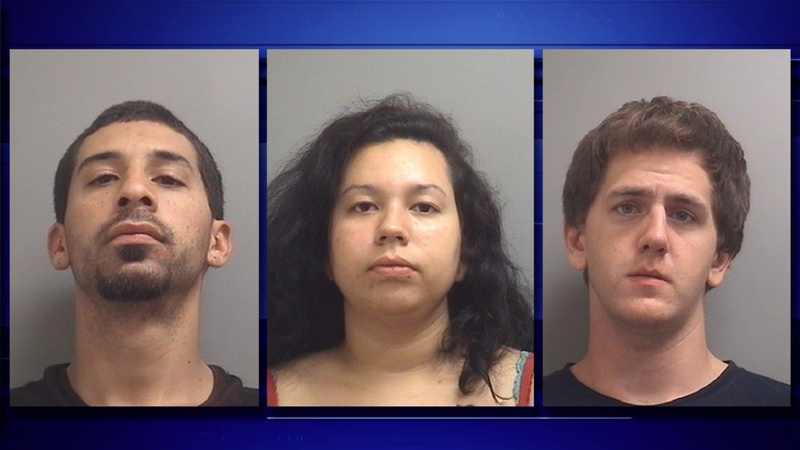 Federico Preciado Jr., 26 (left), Andrea Zavala, 23 (center), and Micah Nelson, 25 (right), all face felony burglary charges. LA PORTE, TX (KTRK) -- Three people face felony burglary charges after La Porte police say video shows the trio trying to break into a Village Pizza and Seafood restaurant. Officers say they spotted a black Toyota sedan in the rear parking lot of the restaurant located in the 1100 block of South Broadway. When officers approached the vehicle, the lights came on and the driver attempted to leave the area. Officers did manage to quickly stop the vehicle and began questioning the three people inside the vehicle, identified as Andrea Zavala, 23, Micah Nelson, 25 and Federico Preciado Jr., 26. Officers obtained permission to search the vehicle and located three large flat head screw drivers and a set of bolt cutters. Officers then inspected the back door of the restaurant and found evidence it had been tampered with. The owner of the restaurant then provided video to police which officers say shows the suspects inside the business trying to pry open the cash register. All three suspects face felony charges which carry up to a two-year prison sentence and a fine of up to $10,000.